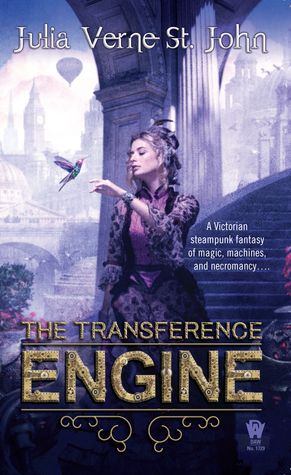 THE TRANSFERENCE ENGINE did a lot of things right with its Steampunk inspired machinery, and its eccentric heroine with a big heart. The necromancy aspect was a definite hook for me, and Julia Verne St. John’s writing style fit the alternate 1830s London time period. The area in which this book didn’t perform was unfortunately the story. The pacing was very slow, and the mysteries weren’t difficult to solve. I enjoyed Madame Magdala’s character a great deal from her refusal to conform to traditional female roles, to her chameleon tendencies, and soft spot for street urchins. I also liked her connection to the Romany people, and the way that the author explored some of their nomadic ways. Ada Lovelace didn’t really add much to the plot other than to set the tone for Lord Bryon’s followers, so her parts were kinda tedious. The Book View Café’s catalogue search engine was a pretty cool gadget, and St. John had plenty more where that came from with things like steam horse drawn carriages, and air balloons. The fact that some of the secondaries were Science or Math driven helped to elaborate on the thought processes behind some of these creations. The explanations with regards to the gizmo that this novel was named for were rather shoddy though. The story was where the author lost me because it involved a whole lot of dialogue and speculation, but not much action. Magda’s street kids are disappearing, there’s an unknown airship hovering over the city up to who-knows-what, and Drew, her lover is somehow involved. The pieces do come together however, the question of whether Byron is really dead is never answered, and the ending was as anticlimactic as they come. THE TRANSFERENCE ENGINE’s “fresh twist on historical literary figures” was anything but. Sounds like an interesting steampunk premise; maybe for the die hards.